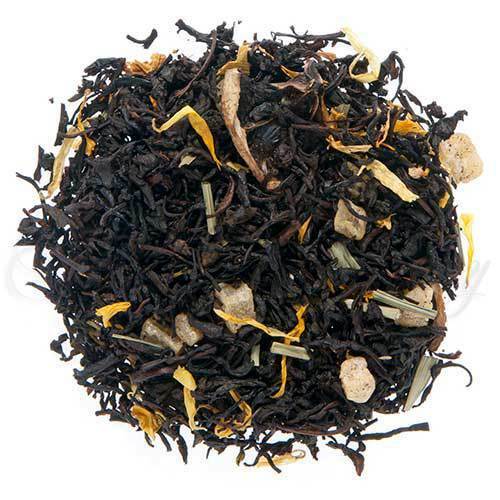 Luxury Ingredients: Black tea, Pineapple & Lime pieces, Lemongrass leaves, Calendula & Sunflower petals, and Natural flavors. Lemons have been enjoyed as summertime refreshment for thousands of years. Over the centuries, many have argued where the tart, bitter fruit originated; some say the lemon first came from Malaysia, China, Persia, or Asia Minor. 20th century archaeological evidence however shows that the fruit came originally from the Indus Valley – a lemon shaped earring carbon dated from 2500 BC was found there. By the first century AD the fruit was being cultivated in Palestine and Greece. By the second century AD lemon cultivation had spread to Libya in Northern Africa. Growers there exported lemons by the shipload throughout the Roman Empire – one can even see a lemon depicted in a mosaic in the ancient city of Pompeii. Many centuries later, as tea became the drink of choice in Britain, people discovered that the tart acidic flavor of lemons complemented the astringency of black tea perfectly. Lemon is now one of the most common additives to a cup of tea after milk and sugar. We’re sure you’ll find our version of this tea refreshing pot after pot. Incidentally, this is one of our favorites poured over a nice tall glass of ice with a sprinkling of sugar. Lemon tea, you can’t beat it. Firstly… we only use high grown teas from the top 3 tea growing regions of Sri Lanka – Nuwara Eliya, Dimbula and Uva. These three high-grown districts produce flavorful teas that have classic ‘Ceylon’ tea character which is noted by floral bouquet and flavor notes, touches of mild astringency, bright coppery color and, most importantly – perfect for use as the base tea of our flavored teas. (We have tested teas from various other origins around the world as base stock for our flavored teas, but none of these teas made the grade.) Dimbula and the western estates of Nuwara Eliya have a major quality peak during Jan/Feb, whereas Uva and the eastern estates of Nuwara Eliya have their peak in July/Aug. This ‘dual peak period’ allow us to buy the best for our flavored tea blends several times during the year, ensuring top quality and freshness.